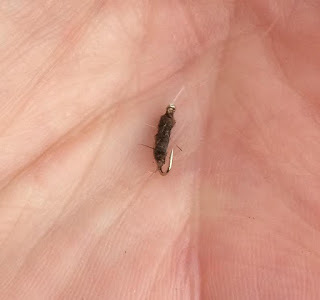 Buzzers are nothing new on the other side of the pond, where anglers have been fishing with them for many years to imitate midge larva and pupa, particularly on still waters. Many anglers in this country know about them but seldom do I run into an angler that fishes them. Back in 1998 we were fishing the Missouri River in Montana and having seen a fair amount of midge larva in the weed beds, I tied a few buzzers with and without bead heads, basing the imitations on what I recalled seeing in British angling magazines. The flies worked very well, especially the ones with bead heads. Since then I have used them all over the country with good success. I've always coated them with Sally Hansen Hard as Nails, but here I've used the Bondic UV resin, which makes for a quick drying, hard shell. Abdomen: Flat thread - Chartreuse. The original ones I tied used the duck quill for the wing buds, but I also use red flexi-floss for wing buds wing buds, which makes a smoother thorax. When I get a chance over the holidays I'll post some pics of the fly tied with other colors and without bead heads. This week's Tightline Productions video has me tying the Three Dollar Dip, a great subsurface fly that is a version of the Serendipity. Both the Serendipity and the $3 Dip originally were tied for use on the Madison River in Southwest Montana; the former, a pattern designed by Ross Marigold, and the latter by Nick Nicklas of Blue Ribbon Flies in West Yellowstone, MT, and named for an access on the Madison River known as the Three Dollar Bridge. I have fished the fly all over the country with success since first learning about it years ago, and recommend giving them a shot wherever you fish for trout. I tie them in sizes #16-20, and also in red and caddis green. Tie some up and fish them as fits your own style. I guarantee you will have fun, and its likely you will catch fish on them. And thanks to Tim Flagler for another great video production. As you may have guessed, I haven't been sleeping well since I heard about trout with hand shaped fungus on them (see 11/9/15 post below). I keep having these vivid nightmares about landing fish that have mushrooms on their sides that are shaped like a hand. Dreadful stuff indeed. For the record no one has sent us with a photo supporting the idea, so I think we can conclude that like Sasquatch, this one is a myth. Time to move on. That's not to say that it isn't very important that we respect our quarry and handle each one for the beautiful creature they are. Again, use common sense when landing fish and if you want a photo, be aware that when you lift them from the water they are out of their natural environment, so make it brief and be gentle. If the fish starts squirming, let them fall back into the water and swim away, a picture isn't worth harming them to keep them still. The memory will stay with you longer than any photo. The 2015 International Fly Tying Symposium is this Saturday and Sunday at the Garden State Exhibit Center in Somerset, NJ. 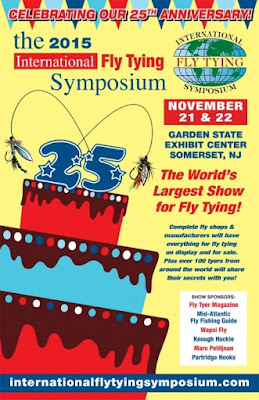 We will be there tying flies all weekend, and on Saturday at 2:30 pm, I'll be doing a seminar - "Fishing Dry Flies and Emergers for Trout". There will be many others tyers from the USA and other countries, as well as fly shops, material and equipment vendors as well as other seminars and presentations. Come on down and stop by and say and hello when you are there. A couple of weeks ago NJ Trout Unlimited held their annual fly fisherman of the year contest at the Raritan Inn in Califon New Jersey, and again it was a big success. The river was quite low and very clear, which made for tough fishing and mixed results among the contestants. In the end it was a great day capped off by a banquet and awards dinner. The winner this year was Sue Reed, who was representing Casting for Recovery. As he always does, Tim spent the day filming the activities and put together this great video that captures the essence of the event. In this week's tying video, Tim Flagler ties the Ken Lockwood streamer, which is named for Ken Lockwood (d. 1949), a conservationist and former outdoor writer from the Garden State. And of course, the Ken Lockwood Gorge section of the South Branch of the Raritan River is also named for him. He wrote a weekly column titled "Out In the Open" in the Newark Evening News, which in time became the Newark Star Ledger, for which I wrote a weekly fly fishing column for years later. Like most streamer patterns, the Ken Lockwood is attractive to both fly fishermen and fish. Tie some up. And stay with us, I'm not done with the hand shaped fungus issue; I've lost too much sleep over it to let it go. Seriously. 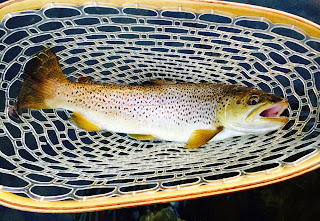 There is a recent blog post on a fly fishing site about grip & grin shots and the proper handling of fish before they are released, and whether or not they are harmed depending on whether they are kept in the water or held up for a hero shot. Like every other subject in America, there are tons of experts on this and most of them are very confident in what they don't know. Or they just want attention, thus they will remain anonymous here. I'm not an expert, but I believe a little common sense goes a long way. That's all I have to say about that, but if you want to read more, do a search on your favorite browser and feel the outrage. What I am really interested in, is that on that same blog post, a so-called guide commented that he has "seen more than his fair share of fish with hand shaped fungus on them." That folks, is a new one to me, and perhaps to you as well. 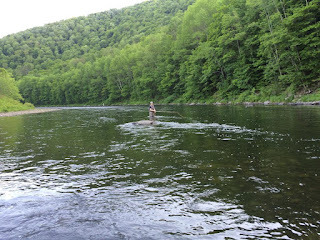 I have been fishing for trout for over 45 years in waters from Maine to California. Some (many) are fished very heavily with the majority of anglers practicing catch and release. And in all those years, on all those rivers and streams, I have never caught a trout that has hand shaped fungus on it. Have you? So, my question is; was this guy exaggerating (bullshitting) to make his point? Or does this really happen and have I just not seen this phenomenon on one of the thousands of trout I have caught over the years? I have caught trout with discolored skin, that may possibly be fungus, no doubt. Usually it is whitish and was found on their head, or fin(s), or back, but always it was without form and never resembling any part of a hand; or human, for that matter. 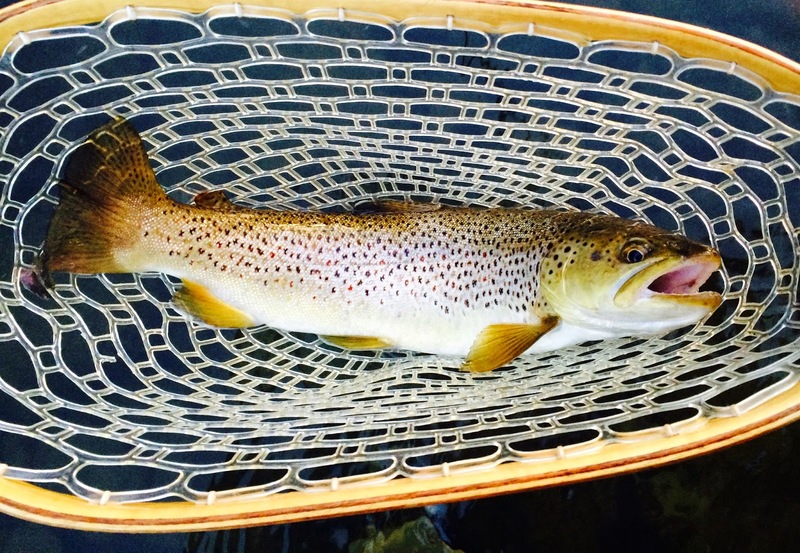 Angler 1: Hey, did you see that lip shaped fungus on that big brown trout I caught? I'm skeptical on this one, so much so that I would like to hear from anyone that has unedited photographic proof showing a fish with hand shaped fungus on it. Now I realize that it is possible, and may perhaps occur in rare instances, but I seriously doubt that any angler has seen even a small "fair share of fish with hand shaped fungus" on their sides. Sure, I'm a little grumpy tonight, but I don't live or fish in a vacuum and this one kind of irks me. Two brothers went to Iceland to find out about the state of conservation in a country where fish and free flowing rivers are still abundant. The scenery alone is enough put Iceland on my bucket list. Enjoy. Here's a neat little variation on the classic pheasant tail nymph tied by Tim Flagler. 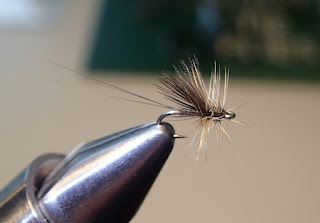 Like every other variation of the pheasant tail nymph, this one works quite well, particularly when fished as a dropper off a larger nymph pattern. It's always good to see a fly tied with 6/0 olive Danville thread! I fished today and did quite well fishing #22 Blue-winged Olives to sipping rainbows in a long, slow pool on the South Branch of the Raritan River. It was a beautiful day to be on the water; warm, breezy with intermittent sunshine through cracks in thick, dark, fast moving clouds. There were just enough olives hatching to keep fish looking up as they slowly cruised about the pool. When a fish rose I would quickly figure out the direction it was headed and then drop my fly softly on the surface a few feet ahead of it. Sometimes they would change direction, sometimes they would swim right under it, and once in a while they would lift up and sip it in and I'd gently tighten the line with a strip set. Just the kind of dry fly fishing I love; tough but rewarding. I used a #22 olive sparkle dun at the end of a 12 foot leader tapered to 24 inches of 6X soft monfilament tippet. I don't have any pictures, but here's something to put a smile on your face - Little Man practicing his golf in the kitchen. I'm not sure if he likes hitting the golf ball or the floor more. Recently, Tim received a pink dry fly hackle cape from Whiting, so in honor of Breast Cancer Awarenesss month we decided to tie a classic Catskill split hackle wing dry fly. For reference, the methods shown here are those that would be used to tie an Adams. I should note that I only used one wrap to split the wings here because the thread I was using was fairly heavy (to me). Normally, I would use 6/0 Danville thread, which tends to require a couple of criss-cross wraps through the base of the wings to get the right posture. The thickness of the hackle stems will also dictate how many wraps that are necessary; it's a feel thing that you will develop as you tie them. Just remember to use as few wraps as necessary to get the wings where you want them. And speaking of Breast Cancer Awareness month, the New Jersey Chapter of Trout Unlimited held their annual One Fly contest and as luck would have it, it was won by Sue Reed, who was representing Casting for Recovery. Casting for Recovery is a wonderful organization whose mission is to enhance the quality of life for women with breast cancer through a unique program that combines breast cancer education and peer support with the therapeutic sport of fly fishing. And if you are wondering what mayfly this pattern imitates, it's a Mammarella curata. After the morning showers ended today, the sun traded places with the clouds and warmed things up enough to make for a very pleasant day on the river. Air temperatures reached the mid-sixties and a gentle breeze pulled the autumn leaves from the trees and placed far too many of them on the water surface for my liking. Trout rose consistently in the low clear currents to minutiae only they could see. It was a beautiful day for fishing, not catching, made even better because my son Matt fished along with me. 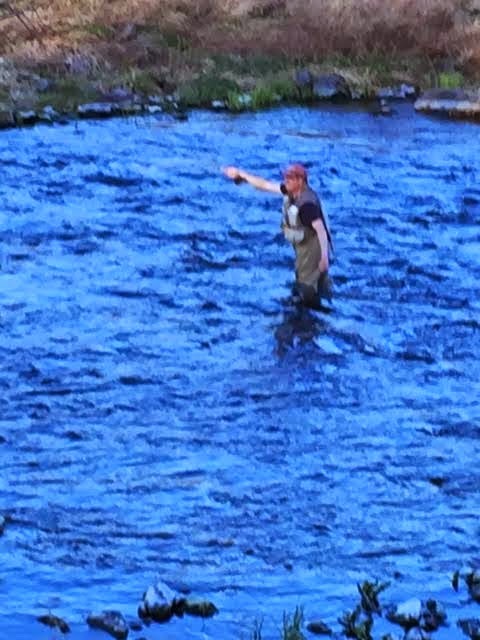 That's him in the photo above blending in with the beauty around him as he tied on his fly. We fished for the better part of the afternoon and had many refusals and even missed a few takes. The trout seemed to get plenty of exercise between rising up to eat naturals, and also to inspect our offerings, sometimes even nudging the fly with their nose before easing their way back down to the bottom. I scanned the surface over and over and didn't see a thing on the water (except leaves). We also didn't see any insects in the air but for a lone caddis. It was one of those days where the fishing was very good, but the catching left us scratching our heads. About 4:30 we called it a day, went to the local Italian joint, and enjoyed a couple of beers, some wings and watched football. What a difference a day makes. Yesterday it was chilly, raw and cloudy. I fished for about two hours late in the day, saw lots of bugs, and caught a bunch of fish on a small Walt's Worm fished on a long, light leader without any split shot. 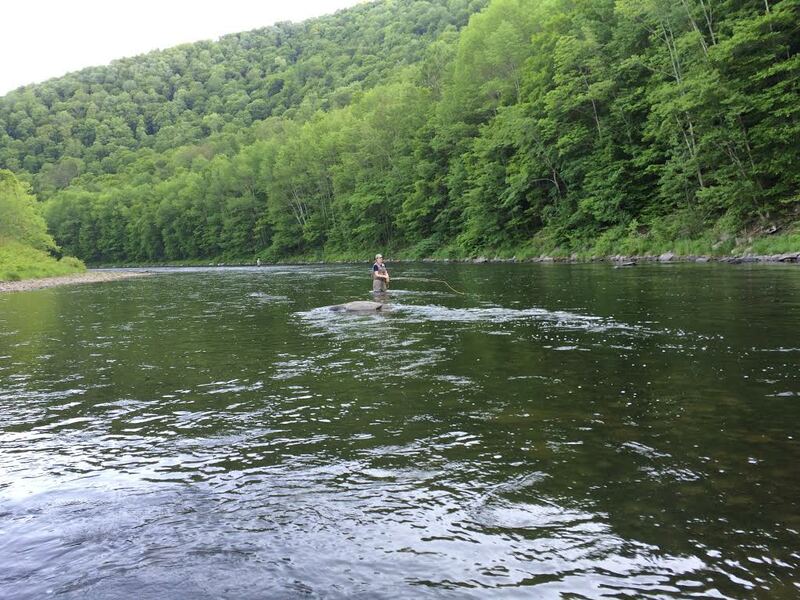 With the very low water, that's about the only way to fish a subsurface fly without getting hung up on the bottom. I cast the fly across and slightly upstream with a mend and then follow my line with the rod tip watching for any twitches or sudden movement in the line or leader. A simple, quick line strip to pull the line tight is all it takes to set the hook. Here's the fly I caught all of my fish on yesterday. It was great to get out and fish again, and just as good to be here writing about it. Matt and I plan to fish next weekend and hopefully we'll have better results than we did today. He certainly works hard at it and is due for a multiple fish day. I'm looking forward to it. If you are not familiar with Andy's blog, you should check it out as he regularly posts some great tying tutorials of diminutive dry flies. Being a believer in the keep it simple stupid mode of tying, and fishing for that matter, these types of patterns are some of the most effective out there when fished properly. This style lends itself to both topwater patterns, and to subsurface patterns. In fact, one of the things I like so much about the RS2 is that it can be fished deep, and at times in the surface film as a small BWO or midge emerger. A friend, Bill Silvia, ties essentially the same pattern you see Tim Flagler tie here but with a tuft of pearlescent ice dub for the wing bud, and does very well on the South Branch and other rivers with this simple pattern. Here's a short video Tim took of the brown trout I caught Sunday evening on the South Branch (see previous post). Hopefully we'll be fishing this coming weekend now that things have cooled and rains have brought the rivers up. In the meantime, I thought I would share this picture my oldest daughter took of my son walking with the little man at the Bronx zoo last weekend. 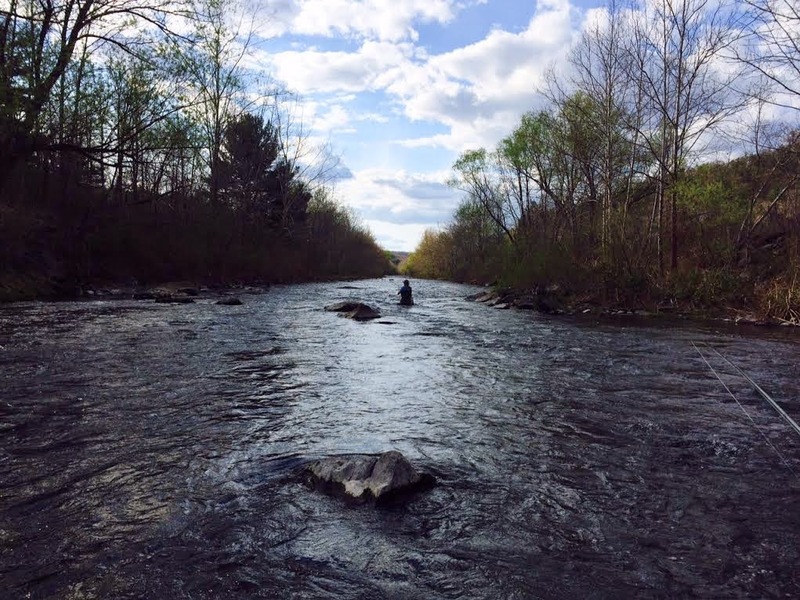 Fly Fishers Wanted: New Jersey’s self-sustaining wild trout populations are looking for a few good champions. 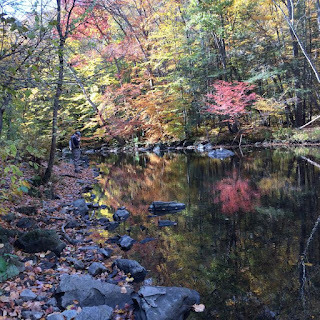 The NJ Highlands Coalition is looking for a few good anglers to participate in the first annual NJ Highlands Wild Trout Stream Invitational Fly Fishing Event, to be held on Saturday, October 17, 2015, rain or shine. This catch-and-release event is being sponsored by the NJ Highlands Coalition and coordinated by Shannon’s Fly & Tackle Shop. For the inaugural event, the objective is to promote public awareness of New Jersey’s official freshwater fish – the eastern brook trout, Salvelinus Fontinalis. 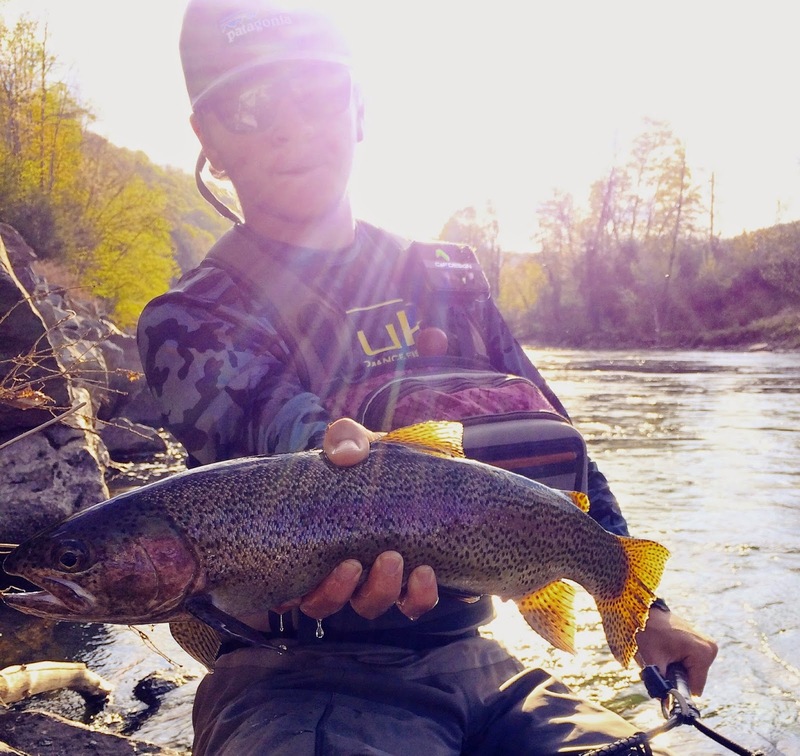 Unlike most tournament-style contests in which the angler with the largest or most fish wins, this event is intended to promote public awareness of the state’s officially designated wild trout streams and their resident wild trout populations. The steam producing the largest number of wild trout will be declared the winner, and the anglers whose numbers have contributed to the winner will be recognized for championing the stream. The event is open to twelve (12) self-selected two person teams, first come, first served. There will be no rain date, and the event will be cancelled in event of flooding, hazardous weather, or poor stream flow or temperature conditions. Anglers will meet at the Raritan Inn, 528 CR 513, Califon, at 8 AM on the morning of the event for orientation. A registration fee of $50 per angler will be collected then. Please contact George Cassa at (908) 892-6238 (cell) or by email at plimsol@earthlink.net to reserve a spot for your team or to request additional information. On the morning of the event, each team will draw an envelope containing the names of two streams together with map, driving directions, parking and access information. Each team will be assigned a morning stream, to be fished from 9 AM until noon, and an afternoon stream, to be fished from 1 PM until 4 PM. 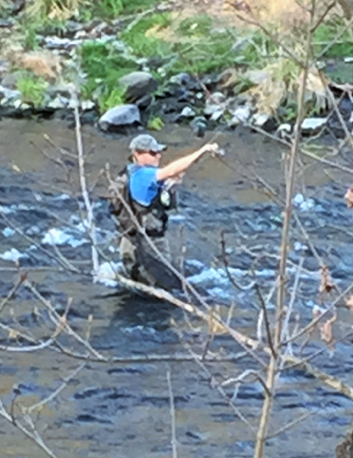 Each team will keep track of its own number of brook, rainbow, and brown trout caught and released. Yep, we got some rain today. Quite a bit, too. The ground was thirsty though and sucked it all up. The rivers gathered what they could, but it didn't amount to much. Tim must have known this would be the case; here's a panfish/bass fly he demonstrates along with some cool footage of its effectiveness. Seems that Kintner Boy can't get a break; first it was sharks, now it's bass and panfish. In a summer of no rain and low water, this fly is the JAWS of life for many fly fishers. The Lamar Valley in Yellowstone National Park is a special place where the great fishing is made all the more wonderful by the valley's beauty. A vast valley that is home to herds of buffalo, grizzly bears, and cutthroat trout filled rivers and streams that is lined by majestic mountains that reach for the big sky in all directions. Watching this video reminds that I must go back there very soon. 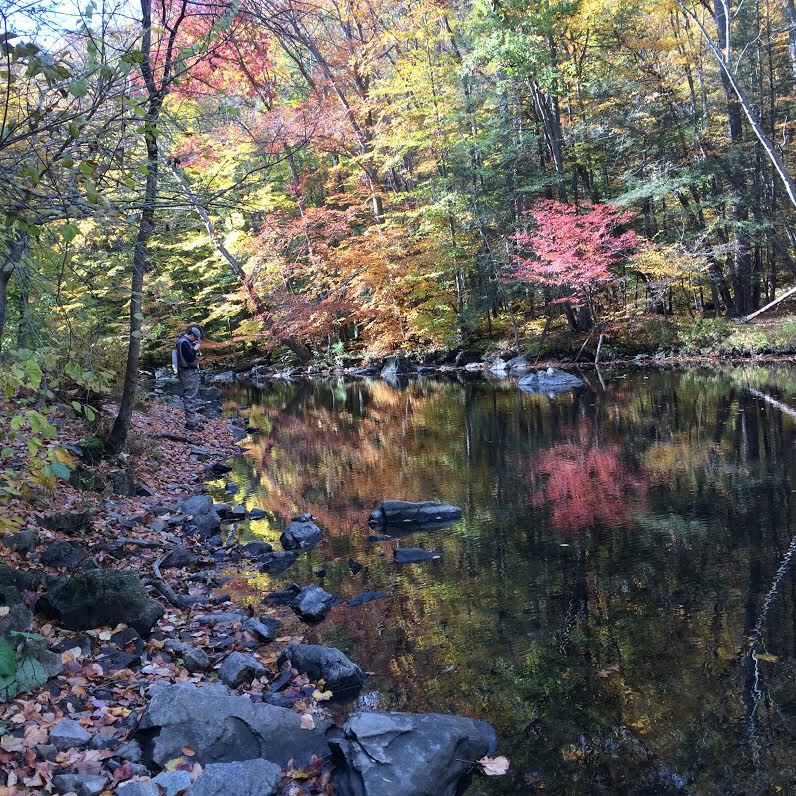 With our New Jersey area rivers being frighteningly low and warm right now, Tim Flagler is looking forward to when we get some serious rain and aggressive fall trout. Here he ties his Dumb Bunny streamer, that not only is a good trout pattern, but also can be tied and fished to target bass, stripers, pike and any other good-sized meat eating fish. 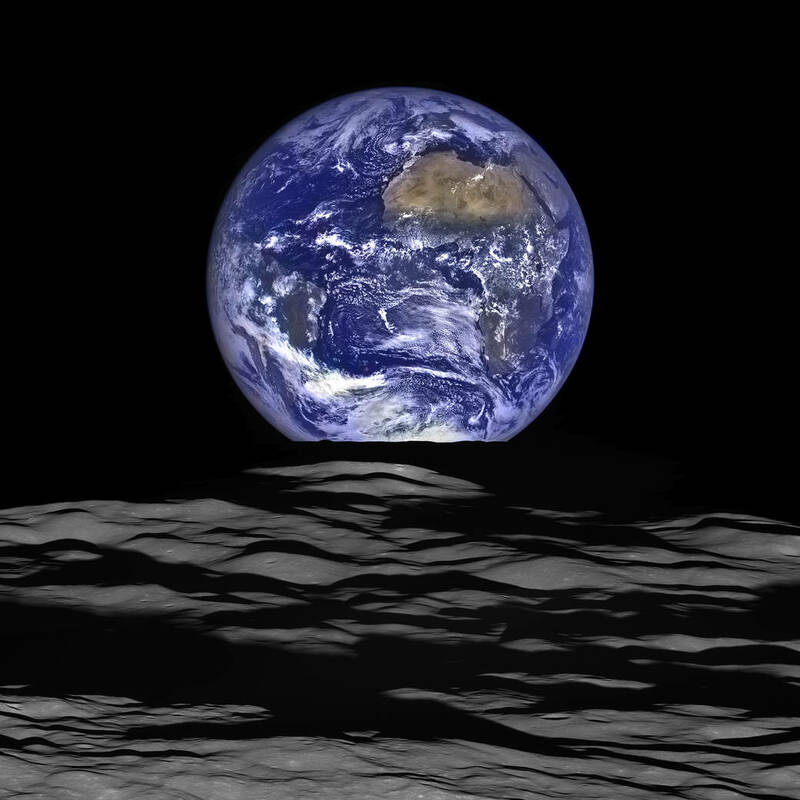 Take a few minutes to watch this great video from Dustin Miller; it puts it all in perspective. 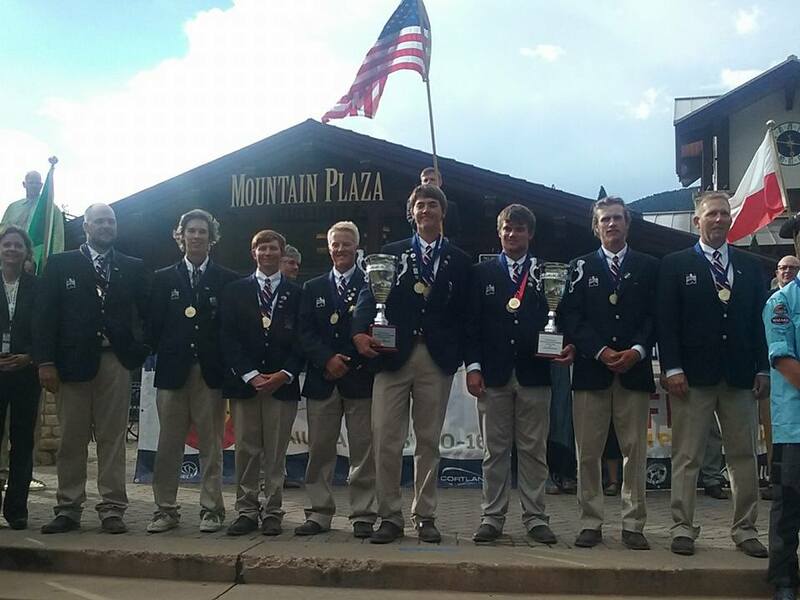 Team USA won its third straight world title, and its fourth in five years — this one in the U.S., specifically on three rivers and two lakes in Eagle and Summit counties, Colorado. Douglas is in the second row, third from left. Here he is with a nice brown. Last year I tied a bunch of Ausable Wulffs for C. D. Clarke, a very well-known sporting artist that happens to live near me and whom I run into around town and at the Tewksbury Inn. When I brought the flies to him, knowing he hunted birds and ducks, I asked if he could swap some woodduck flank feathers in lieu of paying me. He was glad to oblige, but with our busy schedules I forgot about it, and in reality, I was happy to tie the flies for him with nothing in return but knowing he would fish them with the same passion that I tied them with. Fast forward to last week. I was having dinner at the Tewksbury Inn and C.D. 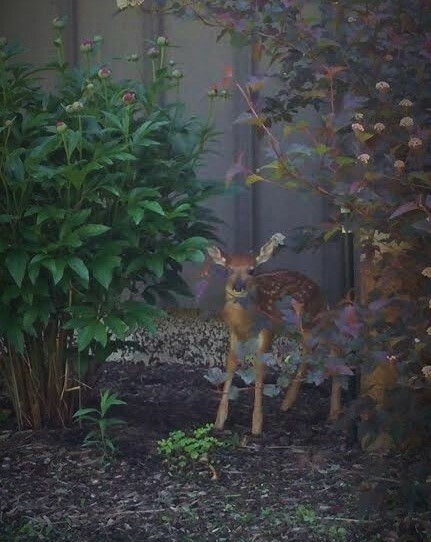 was there having dinner also. We talked for a minute or two, than them he said he'd be right back. While he went to his car I got caught up with his constant companion, Tracey Warmus, on their recent Atlantic salmon fishing trip. In perhaps five minutes time, he came back in carrying a clear bag full of woodduck flank feathers. For a Catskill fly tyer, this is more valuable than gold and I was and am very grateful for his generosity. Since then, I've been using it to tie some of my favorite dry flies - traditional Catskill dry flies. Here's a Quill Gordon I tied on top of two of my favorite fly tying things, a Rite Bobbin and 6/0 Olive Danville thread. 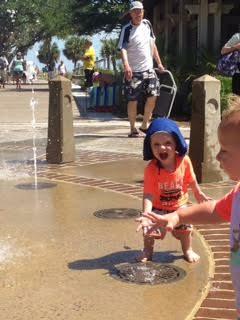 It's summertime and it is hot, even in the shade. It may not be very comfortable for us, but for terrestrial insects, this time of the year is perfect. They are crawling and hopping everywhere - in the trees, the shrubs, grass and fields, crops, and flowers. And of one the most of abundant of them all is the ant. We know this, and the trout know this, and on just about any given day ants fall or are blown onto trout streams throughout North America. With this in mind, it seems that the trout get used to seeing them and feeding on them during the summer months, which is likely why this pattern and other ant imitations work so well not only between hatches but also often during hatches. Tim Flagler says he often does better with an ant pattern (size #14) during Trico activity than he does with a Trico imitation. I like the tinge of brown in this dubbing mix for my own use, any black dubbing of your preference works fine. Also tie some in all cinnamon with brown hackle, and a combination of the two colors with the brown being the abdomen and black for the head. While stripping the usual desirable feathers from a male wood duck gifted by a local hunter last fall, I saved some of the upper coverts on a whim. The other day I finally got around to sorting all the feathers and decided to try tying a spider or two using the coverts to see how they looked in macro. Here’s one using light orange Pearsall’s that came out pretty well. Although the barbs do not have the defined linear markings of waterhen or Gambel’s quail, they are a nice grey dun with a lively appearance. That's a great looking soft hackle; it came out much better than "pretty well". Thanks for sharing, Bill. Last week we posted our video on how we tie a Trico Parachute, and a number of readers have asked about variations with respect to the wing. You can substitute any number of materials for the wing post on this or any other parachute pattern such as poly fibers, antron, zelon, calf body hair, etc., in addition to what we used, EP Trigger Point Fibers. I like the trigger point fibers because they present a low profile wing that is very visible. I think it covers the angler for both the duns and the spinners in most situations. Of course, some of that depends on the angler and his level of confidence in his pattern and how it needs to look to him. Some anglers can only fish a dun if that's what they think is on the water - anything not specifically looking like a dun pattern to them will not give them the confidence they need to fish it. Here's a Trico parachute with a high wing profile, which will imitate the dun stage quite well. The wing here is tied with midge grey micro zelon fibers. The hook is a #125 Dai Riki size 22. The abdomen is 6/0 Olive Danville, which better imitates the females of the species, which some anglers need to drill down to to feel confident in their fly selection. I tie them in both olive and black for shits and giggles, but truthfully, I don't think the trout care in the least. Here's a Trico parachute tied with fluorescent orange CDC puffs for the wing, for the hard of sighting angler out there. They can also be tied using natural or any other color CDC puff to suit your own sensibilities. This one is tied on a TMC100 size 20. Those are some options, go wild with your own ideas but not so much so that you loose sight of your objective.....imitating trout foods. 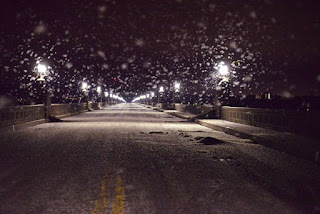 Here's a highly visible Trico pattern we fish in the early morning hours both here in the Northeast, and out West. The one in the video is a size 20, but they can easily tied in sizes 22 and 24, it just takes a little practice. The best way to tie the small ones is to tie a few on the size 20 to get the hang of it, and then go to the smaller ones. I also tie these using the best tying thread out there - 6/0 Olive Danville - which imitates the light olive bodied females. And how about that lighting? Tim Flagler changed his lighting methods for these videos, and it sure does give them some added pop. Post: EP Trigger Point Fibers - click to go to site. I fish these, and all my dry flies, using a George Harvey slack leader using two foot sections for the body. With the transition piece and tippet, it's about 12 feet long. Sharpen your hooks.....and clean your line, doing both makes a difference and will improve your game. Yesterday morning I left the house at dawn to pick up my son before heading out to the Lehigh Valley to hit the trico hatch. About halfway to his house the sky opened up, lighting flashed, thunder crashed and traffic slowed. By the time I pulled into the driveway some fifteen minutes later the rain had slowed to a sprinkle. Matt loaded his gear into my trunk and we were on the way. I tempered his optimism some, as I knew it was likely the creek would be off color from the downpour. If I were alone, I would have turned around. But this was time with my son and if nothing else I could show him one of my favorite spring creeks and let him see how summer rainstorms can change your plans in an instant. When we pulled along side of the creek, it was higher than normal and very turbid, visibility was down to the end of your nose....maybe. I showed him some of the spots I like to fish and told him how years ago a storm like this may have raised the level a little and made the water a little cloudy, but now with all the development surrounding the watershed the run-off was increased by the greater amount of impermeable surfaces - pavement and concrete along and storm water systems that direct water down into the valley and eventually the creek. Before the development, the earth absorbed much more of the water, and what water did flow down the hillsides was slowed by wooded areas that retained the top soil that now washes into the creek and quickly discolors it. Progress? On the way back I showed him a bunch of spots I like to fish on the Musconetcong River, and we stopped for breakfast. We didn't fish, but it was a good morning spent with my son talking fishing, flies, and how to fish the various spots I showed him along the way. We plan to go back out in the very near future when the heat breaks. Fortunately, although it isn't what it once was, the creek still harbors wild trout and decent hatches. Many of you have emailed me asking about how and why we fish that magical summer evening pattern, the Iris Caddis. Late May through September is the time of year when the Spotted Caddis (Hydropsyche sp.) becomes an essential trout food, most particularly in the two month period from late June through Early August. Here in North America, they are very abundant and they are present in just about every river where trout are found. And most importantly, trout love these little buggers. The past few weeks my most productive surface fly by far has been an emerger imitation - the Iris Caddis. The adult natural has a tan/grey body and wings that are ginger mottled with darker, so we tie them with a tan body with a grey tone. They are typically a size #14-18; I mostly fish a size #14 on a standard shank length dry fly hook. Understanding the behavior of this particular aquatic insect is essential to being successful when they are actively hatching. You don't need to be an entomologist or know any fancy language either, just some basic identifying information, and you are good to go. How many times have you been on the river in the evening and witnessed trout aggressively rising yet there are no insects on the water surface? And yet at the same time, you see caddis fluttering about 6-10 inches above the water in clusters? These two questions are the answer to what you should fish - a caddis emerger. More specifically, a tan Iris Caddis dead-drifted right in the surface film - see prior post on tying the Iris Caddis. So what is happening? The caddis pupae swim up from the river bottom and while suspended in the meniscus preparing to hatch, they drift with the current and work to free themselves of their pupal shuck. Once they have separated their new skin from the old, they literally pop out into the air without spending even a nanosecond on the surface as an adult. That is why you only see the adults in the air, and that is why the emerger works so well - the pupa are very vulnerable while preparing to hatch, and the trout know it. The trout feed aggressively because they know they have only seconds once the pupae get to the surface before their meal becomes airborne. Often, the following morning, the adults will return to lay their eggs in the softer water and eddies along fast runs and flowing pools. An adult caddis pattern or spent caddis pattern will take the fish rising to them. I've fished a bunch of evenings the last couple of weeks, and this fly has taken the majority of fish for me. Just about every evening on trout streams from the Northeast to Northern California, caddis hatch and trout feed on them. One of the primary caddis genera that hatches is the Hydropsyche, of which there are over a dozen species that hatch throughout the warmer months of the year. This pattern, designed by the folks at Blue Ribbon Flies in West Yellowstone, MT, imitates the emergers very well. So, tie some up, buy some, or have someone else tie some up for you, and fish them with confidence. My daughter sent me this photo she took of Henley fishing with his dad last evening. 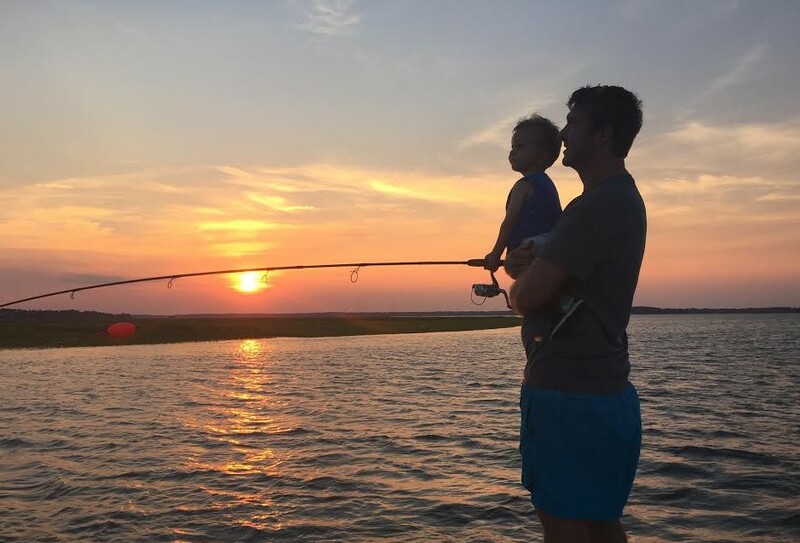 It was Henley's first time fishing, and at 18 months old, she said he wasn't about to let go of that rod for anything. Late in the afternoon Friday my son Matt called me at the office to see if I would meet him on the river after work to fish that evening. It had been a warm day and I said yes, but we would need to check the water temperature first. Since I live only a few miles from the river, I told him I would go home, grab my gear and go down to the river and check the water temperature and call him before he made the half hour drive from his home. When I got to the river an hour or so later, I was hopeful the water temperature would be safe for catch and release fishing as the level was up some from recent rains and it was cool the evening before. We were in luck, the water was 66-67 degrees F, so I called Matt and told him where to meet me. While I waited for him, checked out a few spots along the river and was surprised to see only a handful of anglers with the weather being so nice. It was warm, with hazy clouds dimming the sunlight, and the air was calm. When Matt arrived I told him to leave his waders in the car, we were going to wet wade. After getting ourselves ready we walked to the river and slowly waded in spreading out a comfortable distance, but not too far apart in case he need some help. 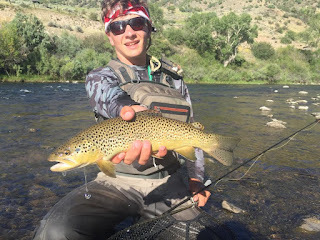 The last few years he has been concentrating on college, and now that he's graduated he's getting back into fly fishing, requiring some refreshing on knots and fly selection. The only flies we saw were clusters of tan/ginger caddis fluttering over the water surface, and an occasional golden or brown stonefly adult. Fish rose sporadically along the opposite bank and in the deeper runs and pockets. Fortunately, this is one of the easier late spring/summer situations to figure out most nights - the clusters of fluttering, light colored caddis in the air over the water, with no adults on the water surface, and fish rising = speckled caddis (hydropsyche) emergence. In this situation I have found that a size #14-16 tan Iris caddis works wonderfully, so I tied one on. Matt tied on a tan caribou caddis, and we both began waiting for rises and casting to those targets. We fished until dusk turned to dark, and we could no longer see our flies on the water. We had a good evening, having caught a number of nice fish, some in the 8-10 inch range, and few 12-14 inch fish. I caught all of mine on the Iris caddis, and Matt got his on the caribou caddis, and later on the Iris caddis as well. He also had few long distance releases, the result of being a little rusty after a few years off. The bottom line, he is doing things right and hooking fish after a long hiatus from the sport. After we packed up I took him to dinner at a local Italian eatery, where we had a good meal and a couple of beers, while we talked about the fishing and other important issues...like what was happening in other sports. 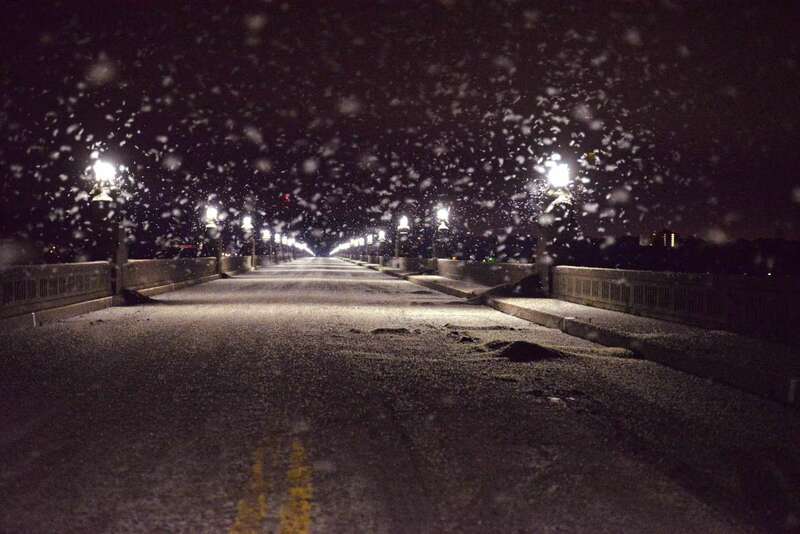 A massive mayfly hatch on the Susquehanna River near Lancaster, PA, led to the closing of the Route 462 bridge Saturday night after they caused several motorcycle crashes. Now that is a hatch! Things have been a little crazy lately, which has put a bit of a cramp in my posting here, yet we keep plugging along boosted by all the good stuff in life. 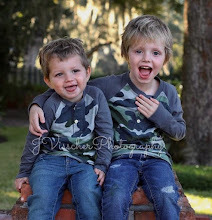 My kids being the primary source of that positive energy. I took this photo of my daughter and Henley, my grandson, at my son Matt's graduation a few weeks ago. There is something about it that brings a big smile to my face whenever I look at it, so I thought I would share it with you all. 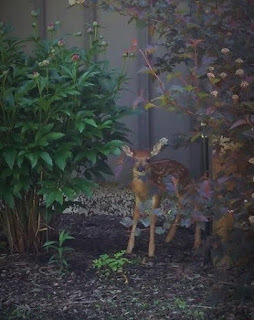 There is beauty all around us, most often in the things that are connected to us. A sharp hook is important, too. Here's a simple but very effective trout pattern I have been fishing for many years to imitate the larger mayflies that emerge in late May through July. It's comprised of three materials, and by changing them up in different colors and sizes, you can imitate a number of mayflies with ease. The pattern floats well and is effective on both fast and slow waters, which is a plus, too. Thanks again to Tim Flagler of Tightline Productions for another excellent job in producing the video. I've been fishing the Missing Link Caddis for several years now, and it has won a spot in my mostly sparse fly boxes - I carry hatch matching patterns specific to where I am fishing and the time of year, and I carry a few general patterns such as this one. The more I use it, the more I like it, because it produces well. And after losing a bet to Doug this past winter, I tied him a bunch of these on comp hooks, and he loves the fly, too, because it works (and because it looks cool). It looks like it is hard to tie, but it really isn't, the trick is to tie up 6 or more at a time so you can develop a rhythm and feel for how to handle each of the materials. The other key to this fly, and most other patterns that incorporate body hair, is to use the best quality hair available. Thanks to Tim Flagler for another great job with the video production! I tied it here in olive, but you can also use tan, black, yellow or even red thread. For hackle, the original was tied with dun hackle. I should also mention that this pattern is also used successfully during mayfly hatches - just tie it in appropriate colors and sizes to match the natural. Tie some up; they work...and they do look cool. This Saturday May 23 TOMORROW, a marketing survey company,70KFT will be conducting a fly fishing survey at Shannon's as part of a national program. Any customer who participates will receive a $25.00 Gift Certificate from Shannon's in exchange for filling out a ten minute survey with a 70KFT representative. All participation is strictly voluntary! If you are around the area tomorrow, stop by the shop and check it out. Here's a timely sulphur usual pattern tied by Tim Flagler, where he employs CDC for the body of the fly instead of dubbing. The CDC body gives the fly buoyancy and it will also retain its color when wet, which is a plus. Often dyed hair dubbed bodies will darken considerably when they get wet, loosing the typical primrose color that matches the natural. The sulphurs, or pale evenings duns, are just starting to hatch in good numbers here in New Jersey, and you will likely be seeing them by the weekend up in the Catskills and Upper Delaware system. Time some up and sharpen your hooks! My son Matt graduated from Raritan Valley Community College yesterday with two degrees - computer science and computer programming. He also was awarded an academic achievement award for having the highest GPA in in his major. I couldn't be more proud, and even better, he's ready to get back into fly fishing with me after a few years hiatus. I just got him some new waders and boots, because as you can see, he has grown a few inches since we last fished together, which was when he was in high school. Matt already has a good job, and he is planning on returning to college in the fall at night to advance his degrees. 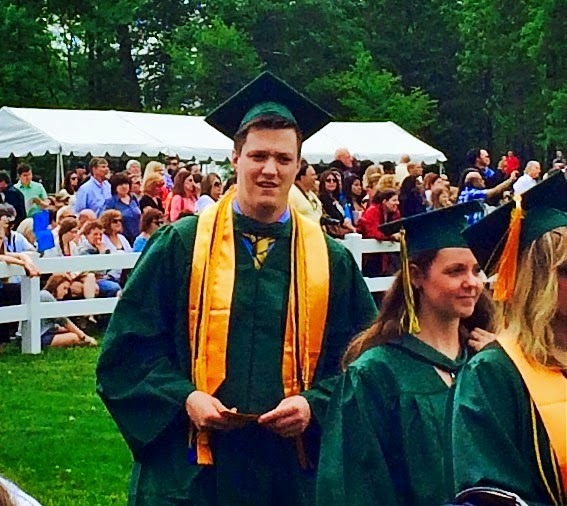 Now all three of my children are college graduates! 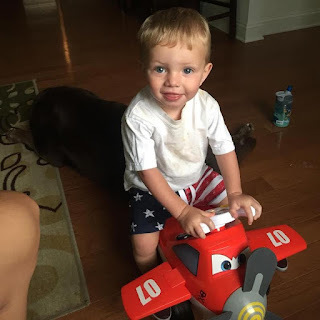 We had one heck of a party for him yesterday here at the homestead. Sharpen your hooks.....we got some rain, so things are looking up. 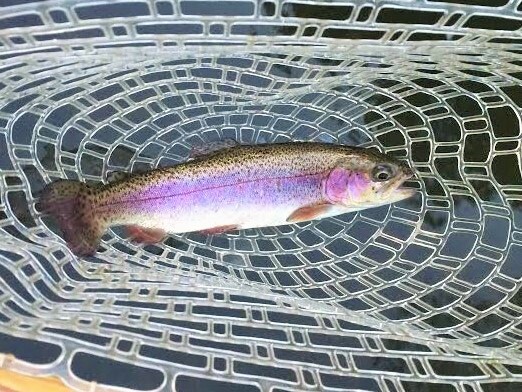 Since I have been too busy to write, here's a shot of a nice rainbow Doug caught in the Beaverkill River this past weekend fishing nymphs in the fast water sections. These fish are wild and they seem to be fairly numerous in recent years in the lower Beaverkill. I'll share more on this past weekend's fishing when I get some breathing room in my schedule. Last evening I fished the Beaverkill River between Cooks Falls and Horton and the number of bugs hatching was nothing short of epic. The air was alive as thousands of grannom caddis hatched and migrated upstream along with Hendrickson duns and spinners, Blue quill duns and spinners, Blue-winged olives, and midges. A glance into the clear flowing water revealed all of the empty nymphal shucks of these newly hatched insects in the drift. It was awesome to be in the midst of. The weather was also unusual for this time of year in the Catskills. 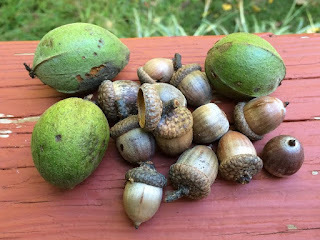 The air was 86 degrees F at 6 o'clock, and with all of the hardwood trees having only mouse-ear sized leaves, it was quite a contrast - summer time heat without any shade. The water was a refreshing 65 degrees F and very clear. It would have seemed the perfect evening for dry fly fishing, and it was, except the trout must have been doing most of their feeding below the surface on the easy prey of the struggling nymphs and pupa ascending the water column to hatch. A few trout did rise along the opposite bank, but only for brief periods before disappearing back down among the rocks. I was fishing the lower end of a long, flat pool, and once a spotted a rising a fish, I would carefully wade into casting position. 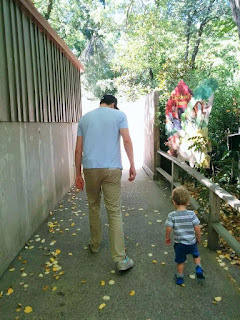 By the time was ready to drop a fly in the fishes feeding lane, it would have stopped rising. But given the situation and knowing the fish would again start to rise shortly, I would wait it out and sure enough it would start rising again. I saw only two fish rising, and with each I had to do the aforementioned dance before catching them both on caddis imitations. It was a wonderful evening to be on the river, and although I expected to see many more rising fish with all those bugs coming off, I had a great time. Half of me was immersed in a cool, clear river that was teaming with life, and my other half was soaking up the sights and sounds that can only be found among a free-flowing mountain stream on a warm spring evening. Time for me to go fishing; the boys already have a good two hours on the water morning and I have some "catching" up to do. 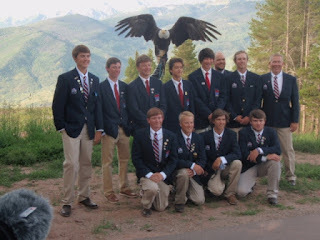 I almost forgot to mention, I've got Douglas and two of his friends from the US Youth Fly Fishing Team staying here at the cabin. They got here just before dark last night and still managed to catch a few from the fast water below the house. I'll have more on their ventures in a later post. 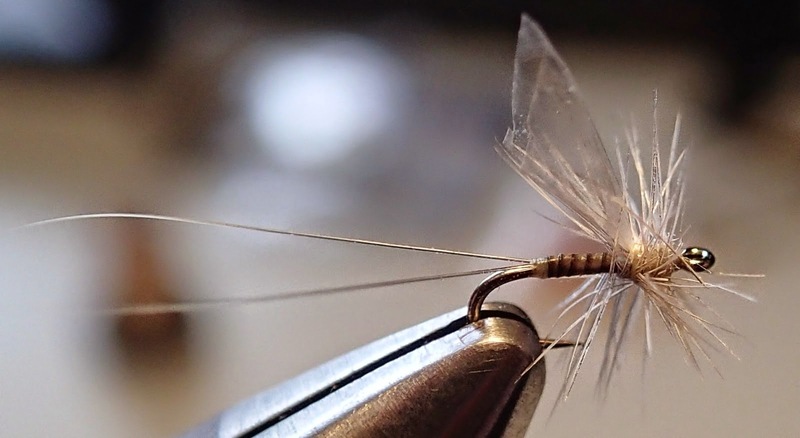 Our friend from across the pond, Andy Baird, is bringing the small fly challenge to us again. 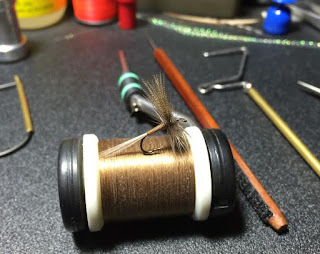 Check out this wonderful little size 24 Generic Spinner he recently posted on his blog, Small Fly Funk. How small is that? The hook shank is less than 1/4 inch long. 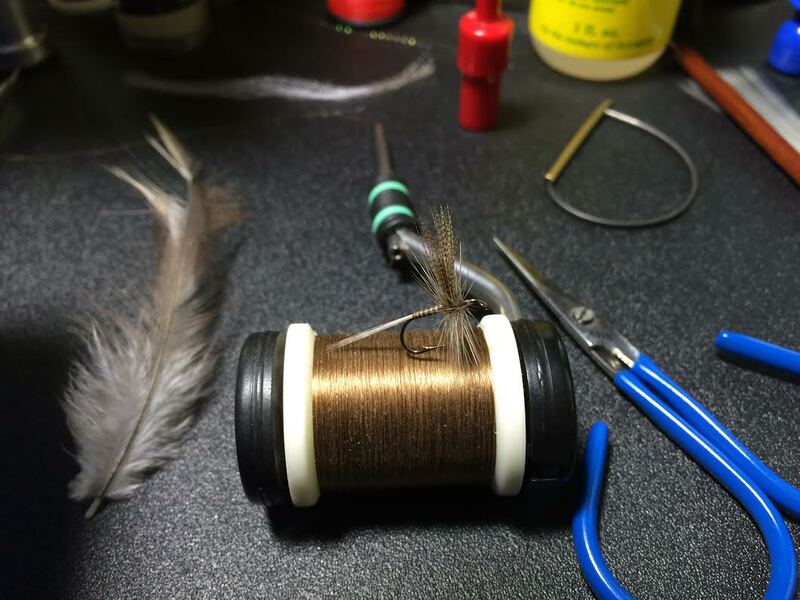 Click on the link above, and there's also a neat step-by-step of Andy tying a size 20 quill body dun. The lack of bulk combined with natural symmetry give his flies a very natural aesthetic few tyers can match when tying such diminutive patterns. Great work, Andy. Not shown - the release. 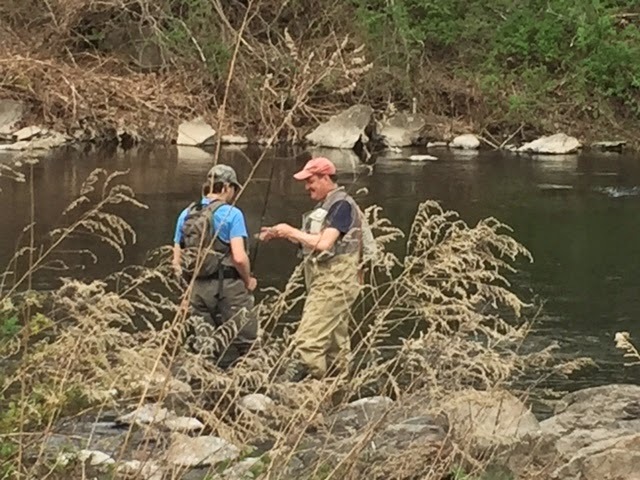 This afternoon I met Doug in the Poconos so we could fish a river that's been on his wish list for a while. Earlier in the day he had spent a few hours fishing another creek further south, and he did quite well catching a couple of dozen fish on nymphs. The weather was great with alternating bright sun and clouds and pleasantly warm air temperatures. 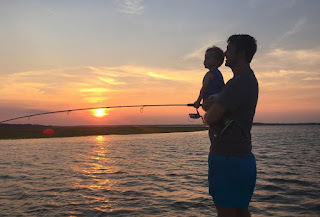 A light breeze blew early on, and as the day turned toward dusk, it picked up some and gave us a little bit of a challenge since we were both fishing 3 weight rods. The river was a little low and about as clear as I have ever seen it. Water temperature was ideal at 56 degrees F, at least that what the science tells us. Too bad most of the trout didn't think so, and that's the science that really matters. We had hoped to find hatching hendricksons, blue quills and caddis, and trout rising to them freely. What we found was waves of caddis coming off, a few hendricksons and blue quills, and even fewer rising fish, There were a few rises, and I did manage to take a fish on a caribou caddis, but the rest of the fish we caught were fooled by nymphs. Here's Doug fighting a rainbow he hooked in a nice run next to the bank you see in the background. 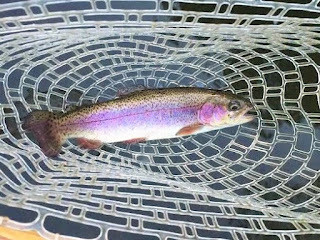 And then there's your writer, standing knee deep in a nice run, where I took a small rainbow on a sparkle emerger. Lots of caddis were hatching in this fast water, and surprisingly we didn't see a single rise. That water was clear from my vantage point - the blue must be a reflection of the sky. Although the catching didn't live up to our expectations - we always expect the fishing to be good on days like today - the fishing was great. We did some catching up and talked about our upcoming trip to the Catskills next weekend. Doug has only fished up there in the fall months, and although we caught fish on those trips, the fishing was so-so with very low water conditions. Right now conditions are good up there on most rivers, and the bugs are just starting to get going, so again we are optimistic and excited about the trip, and there will be some serious fly tying going on at night this week by all of us. And finally, here's an upstream shot I took today of this beautiful stream as it winds its way toward the Delaware River some 5-6 miles downstream. And this just in........that's us admiring the one fish I took on a dry just after I removed it from Doug's net. See how big it is? It fills the frame totally, doesn't it? Sharpen your hooks, and just say, "Yeah, nice fish."